If you are thinking about buying laminate countertops in Atlanta. Think again. You may be trying to save money by choosing a cheap countertop material for many reasons. However, surprising to most is that it is almost never a good idea to buy laminate countertops. This article will discuss why that is the case. The kitchen is one great room in the house that has a lot of activities going on every now and then. It is the hub of the home. 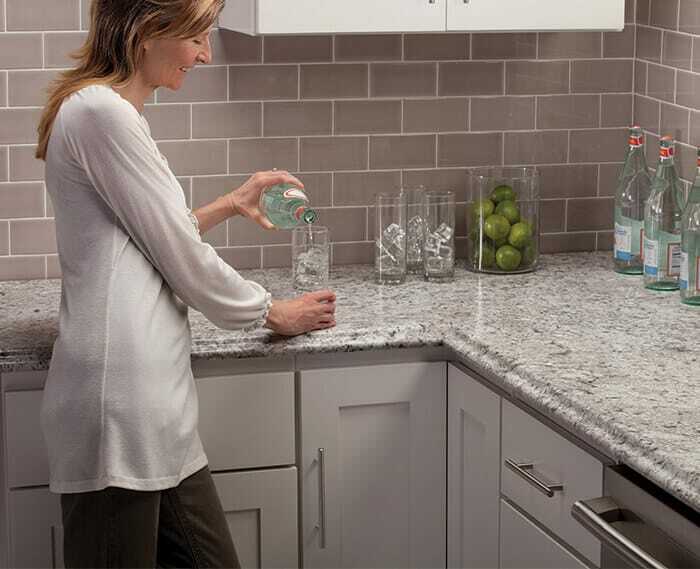 A kitchen countertop should be able to withstand all the activities in the kitchen. The countertop should function as the cutting surface, placing place and decorative element in the design of the kitchen all at the same time. There are many different materials used for countertops. One of them is laminate, which has gained popularity over the years especially among homeowners on a budget. Despite its popularity, there are various reasons why you should never buy laminate countertops in Atlanta. This blog article outlines the reasons why it laminate is not a good option for countertops. If you are really watching your budget, laminate countertops might seem an attractive option for you. But you really should consider the durability. Various countertop materials such as granite, marble and quartz are popularly known for their durability. These countertop types can actually resist heat, scratching, warping, staining and chipping better than the highest-quality laminate countertop. With laminate countertops, you will always be worrying about hot pots and pans and you will not want them installed outdoors or right next to the grill. Laminate countertops might need to be replaced after 10 years. Granite, marble and quartz countertops are extremely durable and they can last forever with little maintenance. Laminate countertops have a limited colour palette. Most of the colour palettes are dictated by the manufacturers of the brands you choose. The colour palette is not unique, and you might find certain laminates designed to like granite, quartz or marble with a repeating colour pattern copied from other real stones. However, the designs, appear more uniform and regular than that of natural stone such as granite. Granite, quartz and marble countertops have numerous colours and patterns. Granite, in particular, has a unique colour pattern. No two granite countertops are ever the same simply because the mineral composition of one stone can vary from one slab to the other. Granite might not achieve a uniform appearance, but it is loved for its deep hues and all sorts of beautiful natural variations. Laminate countertops tend to copy patterns and designs from natural stone countertops like granite. Therefore, they cannot help achieve a luxurious feel in the kitchen. Granite, quartz and marble countertops are known for their ability to bring out a luxurious and classy feel in a room. Laminate countertops always look very pretty when they are new, however, they do not lead to a significant increase in home value. The potential value of a home is always a common concern for homeowners doing a remodel for the purpose of placing the property on the market. If you are considering to sell your house, you might want to upgrade your countertops from laminate to granite, quartz or marble. Laminate is a good option for budget-conscious homeowners, but it could hurt the price of your home. Buyers are highly interested in a house that has natural stone countertops such as granite. So upgrading your countertop is a better thing to do. A classy kitchen would be much less impressive with laminate countertops. Undermount sinks are popularly known for their ability to provide more stylish, upscale look to the kitchen. These sinks are not recommended for laminate countertops because laminate does not have a finished edge. Undermount sinks can be installed with granite countertops as well as quartz and marble countertops. Countertops are something many people want to get right when doing a remodelling. Laminate countertops are not really a bad thing, but they are not really the most preferred countertops by buyers or homeowners. However, they are affordable and a good choice for budget homeowners so they are a few occasions when laminate may be the only option. However, you may be surprised to learn that with a factory direct countertop company, like Art Stone Granite and Marble in Atlanta, the difference to upgrade to granite countertops can actually be very small. If your curious how much it would cost to get granite vs laminate then give us a call, request pricing online, or visit our showroom in Marietta. We offer factory direct countertops that are significantly cheaper than other places. Who Says Hiring the Right Granite Installers in Atlanta Ain’t Easy?